Professor Espinosa’s research focuses in two areas: (1) understanding the mechanical behavior of natural and synthetic nanomaterials across scales, from nano to macro, and (2) developing micro/nano devices for materials research and personalized medicine. R. Yang, V. Lemaitre, C. Huang, A. Haddadi, R. McNaughton and H. D. Espinosa, "Monoclonal Cell Line Generation and CRISPR/Cas9 Manipulation via Single-Cell Electroporation" Small, DOI: https://doi.org/10.1002/smll.201702495, 2018. P. Mukherjee, S. S. P. Nathamgari, J. A. Kessler and H. D. Espinosa "Combined Numerical and Experimental Investigation of Localized Electroporation-Based Cell Transfection and Sampling" ACS Nano, DOI: https://doi.org/10.1021/acsnano.8b05473. B. Wang, T. N. Sullivan, A. Pissarenko, A. Zaheri, H. D. Espinosa and M. A. Meyers "Lessons from the Ocean: Whale Baleen Fracture Resistance" Advanced Materials, DOI: https://doi.org/10.1002/adma.201804574. R. A. Soler-Crespo, W. Gao, L. Mao, H.T. Nguyen, M.R. Roenbeck, J.T. Paci, J. Huang, S.T. Nguyen, H. D. Espinosa, “The Role of Water in Mediating Interfacial Adhesion and Shear Strength in Graphene Oxide,” ACS Nano, Vol. 12, 6089, 2018. R. Yang, A. Zaheri, W. Gao, C. Hayashi and H. D. Espinosa, "AFM Identification of Beetle Exocuticle: Bouligand Structure and Nanofiber Anisotropic Elastic Properties" Advanced Functional Materials, Vol. 27, Cover Article, 1603993, 2017. M. J. Chon, M. Daly, B. Wang, X. Xiao, A. Zaheri, M. A. Meyers and H. D. Espinosa, "Lamellae spatial distribution modulates fracture behavior and toughness of african pangolin scales " Journal of the Mechanical Behavior of Biomedical Materials, Vol. 76, p. 30-37, 2017. J. A. Broussard, R. Yang, C. Huang, S. S. P. Nathamgari, A. M. Beese, L. M. Godsel, S. Lee, F. Zou, N. J. Sniadecki, K. J. Green and H. D. Espinosa, "The desmoplakin/intermediate filament linkage regulates cell mechanics" Molecular Biology of the Cell, DOI: 10.1091/mbc.E16-07-0520, 2017. W. Kang, R. L. McNaughton and H. D. Espinosa, "Micro- and Nanoscale Technologies for Delivery into Adherent Cells" Trends in Biotechnology, Vol. 34, No. 8, p. 665-678, 2016. S. S. P. Nathamgari, B. Dong, F. Zhou, W. Kang, J. P. Giraldo-Vela, T. McGuire, R. L. McNaughton, C. Sun, J. A. Kessler and H. D. Espinosa, "Isolating single cells in a neurosphere assay using inertial microfluidics" Lab on a Chip, Vol. 15, p. 4591-4597, 2015. R. Ramachandramoorthy, R. Bernal and H.D. Espinosa, "Pushing the Envelope of In Situ Transmission Electron Microscopy" ACS Nano, Vol. 9 No. 5, p. 4675-4685, 2015. X. Wei, L. Mao, R. A. Soler-Crespo, J. T. Paci, J. Huang, S. T. Nguyen and H. D. Espinosa, "Plasticity and ductility in graphene oxide through a mechanochemically induced damage tolerance mechanism" Nature Communications, Vol. 6, Article 8029, DOI: 10.1038/ncomms9029, 2015. R. Ramachandramoorthy, W. Gao, R. Bernal and H. D. Espinosa, "High Strain Rate Tensile Testing of Silver Nanowires - Rate Dependent Brittle-to-ductile Transition" Nano Letters, DOI: 10.1021/acs.nanolett.5b03630, 2015. M. R. Roenbeck, A. Furmanchuk, Z. An, J. T. Paci, X. Wei, S. T. Nguyen, G. C. Schatz and H.D. Espinosa, "Molecular-Level Engineering of Adhesion in Carbon Nanomaterial Interfaces" Nano Letters, Vol. 15, p. 4504-4516, 2015. R.A. Bernal, A. Aghaei, S. Lee, S. Ryu, K. Sohn, J. Huang, W. Cai and H.D. Espinosa, "Intrinsic Bauschinger Effect and Recoverable Plasticity in Pentatwinned Silver Nanowires Tested in Tension" Nano Letters, Vol. 15, No. 1, p. 139-146, 2014. W. Kang, J.P. Giraldo-Vela, S.S.P. Nathamgari, T. McGuire, R.L. McNaughton, J.A. Kessler and H.D. Espinosa, "Microfluidic Device for Stem Cell Differentiation and Localized Electroporation of Postmitotic Neurons" Lab on a Chip, 14 (23), 4486–4495, 2014. 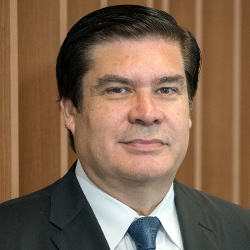 Professor Espinosa has taught a variety of courses, including Introduction to Microelectromechanical Systems (MEMS), Experiments in Micro/Nano Science and Engineering, Experimental Engineering, Elasticity, Damage and Inelasticity of Advanced Materials, Advanced Computational Mechanics, Mechanics of Materials, and Aircraft Structures. His teaching philosophy addresses issues that require particular attention in modern education: (a) the increasingly international world of business and markets; (b) the technological advances that are continuously raising the speed at which information is obtained and transmitted; and (c) the dynamics of the job market that makes likely that most individuals will enjoy several careers in their lifetime. It is his view that a student-centered curriculum in which the student takes responsibility for her or his education rather than a rigid and static core curriculum is the best choice for the future. Such a curriculum maximizes multidisciplinary course work, independent study and research (honor degrees), and encourages experimentation and intellectual expansion.